Why do some Americans, Europeans and Australians love vintage Soviet cars? 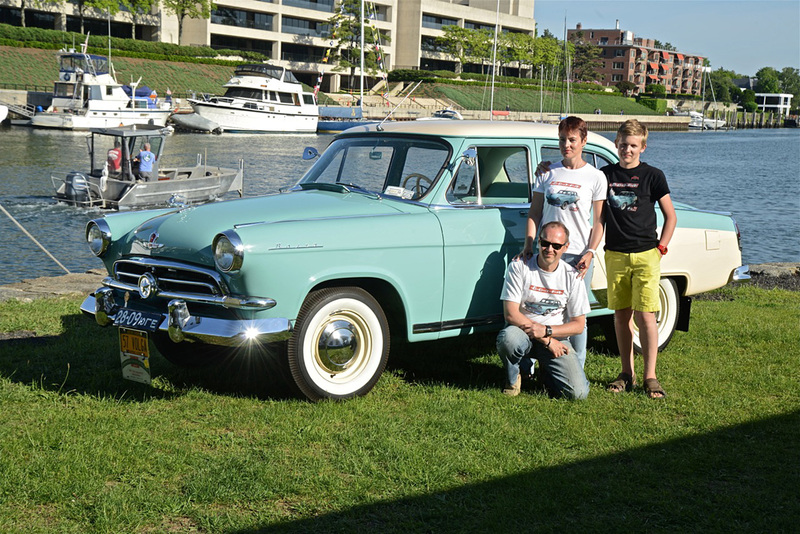 Dmitri Shvetsov with his family and the 1957 Volga М21V. In early 2017, Russian-made cars once again went on sale in Germany and Cuba. A few decades earlier, in Soviet times, Ladas, Volgas and Moskvitches were very popular in Europe and elsewhere around the world. Even today, those vintage cars have many fans. RBTH takes a look at the western love affair with the Soviet automobile. In the mid 20th century, the Soviet Union exported cars to several dozen countries in Europe, the Middle East, Asia, and Africa. In Scandinavia in the 1960s, the Moskvitch-408 was one of the top-selling cars, and also at this time the GAZ-M20 Pobeda (Victory) was popular in the U.K.
1970 saw the unveiling of the first Zhiguli - VAZ 2101 (or Lada), which was modeled after Italy’s Fiat 124. People in the Soviet Union and in other socialist countries waited years to have one of these cars, which eventually became popular in the West. In the U.K., for example, about 350,000 Ladas were sold by 1997. Starting in the late 1970s, the Lada Niva SUV became the most successful car outside the Soviet Union primarily because it was cheaper than competitors, had all-wheel drive and good maneuverability. In total, about 500,000 Soviet vehicles were sold abroad, and many still can be found throughout the world. In May 1978, the first batch of the Lada 21061-37 was sent to Canada as a special international model. It differed from the domestic version thanks to its massive bumpers that had embedded signal optics, which was mandated by North America safety standards. In 1979, more than 5,500 were sold, and by 1981 sales rose to almost 13,000 vehicles. Canadians gladly bought Soviet cars because Lada was one of the cheapest at that time, and not the worst. In Canada, 43 dealerships sold an average of 1,000 Soviet cars every month. Later, the Niva and Samara brands were also sold abroad, but this ended by 1997 due to strong competition from South Korean car manufacturers and the outdated design of Russian cars. Nevertheless, Soviet vintage cars still have many fans abroad. We spoke with five drivers from around the world who don’t plan to swap their Soviet cars for a modern one. Roman moved to the United States when he was a student and now he works at Boeing. Together with friends he organized a club dedicated to Soviet retro cars that is called CCCP - Classic Car Club of Pacific, (in Russian this abbreviation stands for the USSR). Roman and his fellow vintage car enthusiasts regularly hold races across the state and exhibit their vehicles. In 2015, Roman bought his green “Sixth” Lada VAZ 2106 from the owner of a Soviet car museum. "The car came from the Baltic States, and I had it refurbished. Now the car surprises people on American roads," Roman said. "I use it rarely, and therefore it’s in good condition. I take it out only in good weather. Every time it’s like a return to the past." "If something breaks, Miami has a large auto store that also sells parts for Soviet cars," continued Roman, adding that it’s also possible to order spare parts from Russia, Ukraine and Europe. Dmitri studied at the Moscow Automobile and Road Construction University, and now he lives and works in New York as entrepreneur. Dmitri bought his Volga in 2013 in Russia and then shipped it to the United States. For almost 60 years, the car was riding the roads of the Moscow region, and now it’s a big hit on American roads. The car even has its own website. "My car was restored and assembled by hand, with meticulous attention to detail," said Dmitri. "Every attempt was made to use original Soviet-made parts, and assembly was performed to factory specifications. Prior to being shipped to the U.S., the vehicle participated in three car shows in Europe and Russia. All the restoration work done in the past five years gives me confidence to say that this car is one of the most perfectly restored first-series Volga cars in Russia, and, without a doubt, the best Volga in America. This is the only first-series Volga on U.S. roads at the moment. In the U.S., there are 2 more such cars, but both cannot ride because they’re in poor shape." This is Dmitri’s second Volga. The first one was from1962, but unfortunately it sank in 2012 during Hurricane Sandy. The GAZ 21 was produced until 1970. These cars were primarily enjoyed by Soviet officials. Dmitri said that Americans often ask what it's like to drive this car. "I jokingly say that it handles like a 60-year-old Soviet car...but I get a lot of pleasure owning such a rarity!" This young British building surveyor owns a Lada Riva, which was originally a gift for his 21st birthday. The car is being restored; already its old engine has been removed and replaced with a Ford 2-liter Zetec engine. "We found the car on eBay and had it transported from its home in Glasgow to Kidderminster, where the car is now kept," said William, adding that it had only 9,865 miles on it, and the inside looked like it had never been touched. "Although I planned to change the engine I wanted to see why the car wasn't starting; so I hooked up a battery and the motor turned, but did not fire. I’m not an experienced mechanic so it took me a few days to discover and rectify the problem. It needed a new fuel pump, ignition coil and a new set of points, and then she ran beautifully. So, I took her for a little drive around the parking lot." "After, I decided to test the lights and the horn. To my surprise not even one bulb was missing on the old girl; everything worked perfectly. When I purchased the car I knew she needed some serious work, and upon inspection the car had major amounts of rust in the front end, but the rear of the car was fine." Benny searched for this car for about a year and a half. “I just got my Lada and have big plans for it. But first I have to fix the electrical system because the previous owners messed it up and it's not safe to drive at the moment,” he said. "I'm a mechanic and specialize in German and Italian cars. All the motorized gear in this Lada is the same as a Fiat so I'm going to put a Fiat motor in it for more power," he said. Dorka is a bartender at a Budapest nightclub, and she bought her Lada 2101 in June 2015, and calls it Rozi. The date, the model and the license plate number are tattooed on her leg, along with a Lada logo. "She’s very important to me," Dorka said. "Since I got her, she went through a complete overhaul, including the car body and frame; and the engine will be ready any day now." Almost all parts are now black and pink. "In the past, she had a lot of issues and not too many people believed she could be salvaged. But I did, and now she will soon be ready. I became a Lada fan because of my dad, who used to have a white 2101. I love her very much and will never sell her. It’s my life!"